IMU CET Result 2017 Download @ imu.ac.in : The IMU CET Result 2017 declared on 31st May. All the candidates those have given the entrance test can check their results on 31st May at 5 PM from the IMU Official website, imu.ac.in. The IMU has earlier announced that the IMU CET result 2017 is going to be released on 30th May but now it has postponed to 31st May. All the candidates can check the IMU result, Rank, & score from the IMU Official portal. Imu.ac.in. Candidates can go through the following article to explore more information on results. 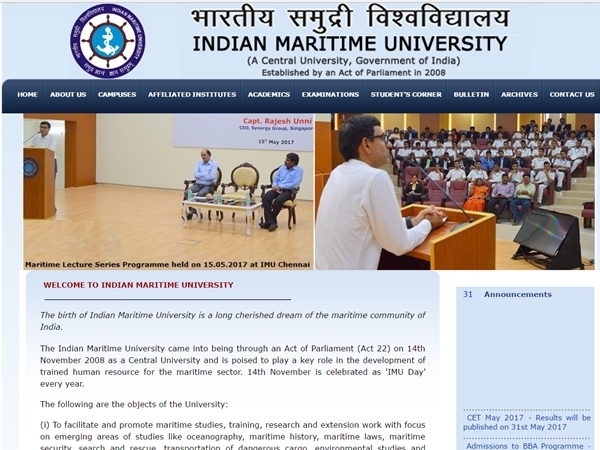 The Indian Maritime University (IMU) is the central university established in the year on 2008. It is the central university that offers various undergraduate and post graduate courses for students. Annually students showing interest to obtain education from IMU are rising notably. The IMU is going to provide the admission into various courses based on the merit of the students. The IMU annually organizes the Common Entrance Test (CET) examination for hopefuls seeking admission in various courses. Every year a huge number of hopefuls compete for IMU CET entrance examination. Like as every year the IMU has conducted the CET examination this year on 27th May 2017. Candidates in large numbers have enrolled and attempted the IMUCET this year. The IMU has reported that 15,466 candidates were appeared for the examination, in which 442 female candidates were also given the test. Competitors qualified in the IMU CET examination will have to undergo the physical fitness test, and medical fitness test. Candidates those have cleared these 2 tests can attend the counselling round to get admission in IMU. Physical Fitness Test: Candidates have to attend the physical fitness test which is going to be conducted by the Director General of Shipping, Mumbai and candidates has to get clearance. After that choose online, the Programme and also IMU Campuses/Affiliated Institutes that they would like to join. Candidates will be allotted seats to a Programme/College on the basis of the following: IMU CET Rank, Category, Choices of Programmes and Colleges and Availability of seats. After the last date for Online Counselling is over, the First List of allotments will be published. Once the Original documents have been verified and medical fitness is established, the candidate will be required to pay the Programme (non-refundable) Fee of Rs.25,000/ or Rs.27,500 to IMU. Annual Fee Structure: Annual Fees Structure of DNS Course leading to B.Sc. (Nautical Science)/ B.Sc. (Nautical Science) / B.Sc. (Maritime Science) programme / B.Tech (Marine Engineering) and B.Tech (Naval Architecture and Ocean Engineering) is INR 2,25,000. In case the seats remain vacant, then the Second List and Third List will be issued. In the Second List, some of the candidates may get upgraded i.e. they may get a Programme or College or both as per their order of preference which they could not get in the First List. Visit official website of IMU, ac.in or click on the direct link that will be given here. Now, you need to give your IMU Hall Ticket Number or the registration number carefully and the other details necessary and finally submit those details. Finally the score or else the merit list will be displayed on the screen through which you will be able to check your IMU CET Results 2017.